Collapsing glomerulopathy (CG) has become an important cause of ESRD. First delineated from other proteinuric glomerular lesions in the 1980s, CG is now recognized as a common, distinct pattern of proliferative parenchymal injury that portends a rapid loss of renal function and poor responses to empiric therapy. Notwithstanding, the rise in disorders that are associated with CG, the identification of the first susceptibility genes for CG, the remarkable increase in murine modeling of CG, and promising preclinical testing of new therapeutic strategies suggest that the outlook for CG as a poorly understood and therapeutically resistant renal disease is set to change in the future. This focused review highlights recent advances in research into the pathogenesis and treatment of CG. The growing recognition in the past 25 yr of collapsing glomerulopathy (CG) as an important cause of ESRD is ascribed to both true increases in its incidence and detection bias. The first cases in the literature trace back to HIV-negative patients who underwent biopsy in 1979 (1). However, antecedent descriptions of a strikingly similar “malignant” focal segmental glomerulosclerosis (FSGS) and of glomerular lesions with podocyte hyperplasia and retraction of the glomerular basement membrane (GBM) suggest that CG likely existed before 1979 (2–5). This historical detection bias as a result of a lack of recognized nosology for CG contrasts with the true expansion of CG that occurred after the onset of the HIV pandemic, leading HIV-associated nephropathy (HIVAN), the term most often used for CG in HIV-positive patients, to become a major cause of ESRD (reviewed in references [6–8]). Multiple clinicopathologic analyses of retrospectively collected cohorts of HIV-negative and HIV-positive patients substantiated the hypothesis that a distinct pattern of proliferative parenchymal injury rather than any specific associated disorder is responsible for the higher incidence of the nephrotic syndrome in CG versus FSGS at presentation, followed by renal replacement therapy in 50% of patients as early as <1 yr but not beyond 2 yr later (1,9–18). By light microscopy, the glomerular filtration barrier that is formed by podocytes, the GBM, and the fenestrated capillary endothelium is altered profoundly (Figure 1) (19,20). Hyperplastic and hypertrophic podocytes (i.e., “pseudocrescents,” which differ pathologically from true crescents in that the former are composed of large epithelioid cells that resemble immature podocytes, extend from the glomerular tuft toward Bowman’s capsule, and do not contain fibrin) overlay segmentally or globally collapsed capillary loops, structural changes that can exist before the development of any significant glomerulosclerosis (19,20). Importantly, however, glomerulosclerosis often is present in conjunction with the collapse of capillaries at the time of pathologic diagnosis, and many consider CG to be a distinct structural form of FSGS, describing the glomerular lesion as the “collapsing variant of FSGS” or “collapsing FSGS” (19–21). Collapse of one capillary loop is diagnostic for CG by the Columbia classification scheme (20,21). Ultrastructurally, podocytes show effacement of foot processes, swelling or disappearance of primary processes, and loss of the actin-based cytoskeleton. The underlying GBM is wrinkled and folded with subocclusion of capillary lumens (19,20). Extensive tubulointerstitial disease often is present as well, and aberrant proliferation of tubular epithelium can lead to microcystic transformation along any segment of the nephron (19,20,22). This often is accompanied by a dense cellular infiltrate within the interstitium that is composed largely of mononuclear phagocyte lineages, CD4+ lymphocytes, and CD8+ lymphocytes (19,20,23). Histopathologic and ultrastructural features of collapsing glomerulopathy. (A) A silver-stained section from a human kidney biopsy showing global collapse of the capillary tuft and pronounced podocyte hyperplasia and hypertrophy (i.e., a “pseudocrescent”) that is filling Bowman’s space. The arrows point to the silver-stained remnants of the capillary tuft. (B) The tubulointerstitium from the same biopsy of A shows microcysts that contain proteinaceous casts. (C) Electron micrograph that contains a normal glomerular capillary from a wild-type C57BL/6 mouse. Note the normal thickness and contour of the glomerular basement membrane (GBM) and the well-preserved podocyte foot processes. (D) Electron micrograph of a collapsed glomerular capillary from a C57BL/6 kd/kd mouse with CG. Note the folding and wrinkling of the GBM with subocclusion of the capillary lumen marked by *. Podocytes show pronounced foot process effacement. (E) Immunohistochemical nuclear staining for Ki-67, a marker of cell-cycle progression, is absent within this normal glomerulus from a wild-type C57BL/6 mouse. (F) Expression of Ki-67 is detected clearly within glomerular epithelial cells that are forming a pseudocrescent in this diseased glomerulus from a C57BL/6 kd/kd mouse with CG. Magnifications: ×400 in A and B; ×25,000 in C and D; ×400 in E and F. C through F reprinted from reference (73), with permission. Unlike other podocytopathies, the podocyte injury in CG is characterized by a marked dysregulation of the quiescent podocyte phenotype (24–34). Diseased podocytes exhibit a loss and gain of markers of differentiation and proliferation, respectively, and podocytes have been described to “transdifferentiate” toward a macrophage-like cell (Table 1). Recent studies indicate that parietal epithelial cells also may be recruited into the viscerally located proliferative lesion (35,36). This suggests that distinct pathogenic mechanisms may induce the pattern of glomerular injury in CG. Indeed, whereas a decrease in the number of podocytes (i.e., “podocytopenia”) within diseased glomeruli plays an important early role in the progression of some other structural forms of FSGS (19,20), research to determine what causes the opposite pattern of hyperplastic epithelial injury in CG have provided insights into the pathogenesis and potential treatment of CG (discussed next). One outcome from the growing awareness of CG as a distinct pattern of proliferative parenchymal injury has been the exponential increase in reporting its association with disorders other than HIV or as idiopathic (Table 2). This expanding literature likely represents a greater overall trend in the diagnosis of CG. When broadly categorized, these reported disorders fall into six areas: Infections (herein includes poorly defined febrile illnesses) (12,13,37–46), autoimmune diseases (13,47–51), malignancies (13,52–54), genetic disorders (55–58), drug exposures (59–63), and during the posttransplantation period (64–70). Not surprising, wide-ranging hypotheses for the pathogenesis of CG have been posited over the years on the basis of this growing list, and no one definable pathogenic trigger for CG has emerged clearly from examining these disparate disorders as a group. Nonetheless, clinical correlates do exist within these associated disorders, which may provide important clues to the pathogenesis of CG, as follows. First, as initially recognized by Laurinavicius and Rennke (19), most associated disorders involve a perturbation in immune homeostasis, thereby suggesting some role for immune activation in the development of CG. It is interesting that many involve T helper type 1 responses, an immune deviation that already is known to exacerbate and accelerate other proliferative parenchymal renal diseases (71), particularly crescentic glomerulonephritis, a glomerular lesion that is defined by the presence of true crescents rather than by “pseudocrescents” (72). Second, although not as pronounced as in HIVAN (6–8) or as in previous reports on idiopathic CG (18), patients of African descent are disproportionately represented in Table 2, particularly among associated disorders that are known to activate immune responses. As a percentage of the total number of patients listed, 50% are African, 33% are white, 10% are Hispanic, and 7% represent other races. Therefore, as with HIV (6–8), some of these associated disorders may unmask some genetic susceptibility to develop CG, underscoring the need to identify responsible genes for preventive, diagnostic, prognostic, and possibly therapeutic interventions. Finally, because the first mutant genes that were mapped by forward genetics to cause susceptibility to CG in humans (Table 2) and in animals (Table 3) directly impair mitochondrial function (56,73), the question arises whether mitochondria in general may lie within a common pathogenic pathway for CG. For example, by acting as the major cellular organelle mediating many apoptotic insults (74), mitochondrial release of cytochrome C within renal epithelium that is affected by various disorders could be a common early event in the development of CG. Clearly, further studies are needed to support or refute any multifactorial causation for CG that is invoked by these clinical correlates. The pathogenesis of CG is an area of intensive research and a focus of healthy debate. As mentioned above, this inquiry is challenged further by the growing list of associated disorders. Certainly, one promising advancement in research into the pathogenesis of CG has been the development of >10 independent murine models of CG within the past 15 yr (Table 3). Unlike in humans, the initial pathogenic insult or susceptibility to disease is known in nearly every model, and its role plus the subsequent steps in the development and progression of disease can be readily investigated in vivo. When broadly categorized, CG occurs in these models secondary to four different initiators, namely, HIV-1 gene products (75–80), Ig (81–83), oxidative stress (73,84–86), and alterations in podocyte autocrine or paracrine function (87). Collectively, these murine models offer the unique opportunity to address a central question about the pathogenesis of CG: How do such seemingly different insults lead to the same pattern of proliferative parenchymal injury? In other words, is there a “best-fit” model for the pathogenesis of CG? Furthermore, each model raises the possibility that a true equivalent exists in humans. The first recognized and propagable model of CG, the Tg26 transgenic mouse, was fortuitously discovered while transgenic techniques were being applied in mice to identify any pathologic features of HIV-1 infection that are linked to the postintegration phase of the HIV-1 life cycle (75). This led to the hypothesis that HIV-1 gene products directly induce HIVAN (6–8), and several independent laboratories have worked since then to delineate through murine modeling which specific HIV-1 gene products, infected cellular compartments (e.g., lymphoid versus nonlymphoid), and host-derived co-factors ultimately are responsible for mediating HIVAN (22,75–82,88–107). Despite intensive efforts over several years, no clear consensus on these questions has been reached yet among investigators. Moreover, this inquiry will need to consider the recent finding of an extensive dendritic cell network in intimate communication with the renal parenchyma in normal kidney (108). Dendritic cells are important mediators of HIV-related diseases in many lymphoid and nonlymphoid tissues, contain several mechanisms of HIV infectivity, can harbor infectious HIV viral particles for prolonged periods, and can provide HIV gene products (e.g., tat, nef, vpr) to and transenhance HIV infection (e.g., tight junction synapse formation) of neighboring cells, among other pathogenic activities (109). A second fortuitous discovery that led to the hypothesis that Ig may induce CG was the recognition of CG in mice that received injections of sheep polyclonal antibodies that were raised against total glomerular protein (i.e., both the cellular and the extracellular fractions) from rabbits (81), a technique that can expose mice to antibody that is directed against species-conserved epitopes on podocytes. This was the first model to show that extensive antibody-mediated damage to podocytes can recruit epithelium from the parietal surface of Bowman’s capsule into the viscerally located proliferative lesion in mice (81). This antibody-induced CG later was recapitulated by models using mAb that were directed against one neo-antigen ectopically expressed on podocytes (82,83). It is interesting that rats were found recently to develop CG after receiving serum Ig from some patients with CG (110). Could cell-associated factors on podocytes, perhaps as a result of molecular mimicry or epitope spreading, be targets of autoantibodies in some patients who develop CG, for example, in patients with systemic lupus erythematosus or in patients with recurrent CG after renal transplant? Not all models have resulted from introducing genes or antibodies into small animals, and three models, the kd/kd mouse (73), the p53R2 null mouse (84,85), and the Dahl salt-sensitive rat (86), are genetically susceptible to CG secondary to oxidative stress–induced injury to renal parenchyma. The genetic cause for this susceptibility is known for the first two models, whereas a genetic reason for why Dahl salt-sensitive rats can develop CG along with other glomerular lesions has not been reported. If human equivalents for these susceptibility genes exist, then interventions to decrease environmental stress could affect the development or progression of CG in patients who harbor these genes. A proof of this concept has been demonstrated already in kd/kd mice, in which caloric restriction or birthing into a germ-free environment rather than a specific pathogen-free environment ameliorates CG in this model (111). Eventually, as dysregulation of podocytes ensues in CG, the physiologic, trophic autocrine (112,113), or paracrine (114,115) interaction of vascular endothelial growth factor (VEGF) with podocytes or with capillary endothelium, respectively, will be disrupted. Although the exact point at which this occurs is speculative, its potential role in the pathogenesis of CG was discovered by directly overexpressing a specific VEGF isoform in mouse podocytes in vivo (87). These mice develop global collapse of the capillary tuft, suggesting that injury to podocytes with a concomitant change in their normal autocrine or paracrine function likely contributes to the development of CG. Whether aberrant VEGF signaling, either by changes in VEGF production or by alterations in VEGF receptor signal transduction, in the absence of any previous insult to podocytes initiates CG in humans is unknown. How could these different insults lead to the same pattern of proliferative parenchymal injury if, paradoxically, the initial phenotypic response of renal epithelium that seems to be shared in common across insults is apoptosis or necrosis? One potential answer to this question comes from recent studies to determine why death of some epithelial cells leads to hyperplasia and transformation of adjacent epithelium rather than normal repair in some disease states (Figure 2). These studies found that the integration of external cues that are produced via apoptotic or necrotic epithelium by adjacent epithelium, particularly in inflammatory microenvironments, renders the adjacent epithelium poorly responsive to cellular controls that would normally limit proliferation (116,117). As a result, the parenchymal phenotype that is most evident after initiation of disease is hyperplasia. This has clear pathophysiologic consequences because the contribution from dying epithelial cells to the loss of organ function becomes greatly amplified by the additional loss of cellular function from proliferating and dedifferentiated epithelium that surrounds the initial sites of injury. Although this speculative “best fit” model has not been investigated directly in CG, preliminary studies to characterize the earliest stages of development of CG in some murine models have found that apoptosis or necrosis of renal epithelium occurs before the aberrant proliferation of renal epithelium becomes apparent (80,84,85,94,118). A speculative “best-fit” model for the pattern of parenchymal injury in collapsing glomerulopathy. (A) Within the pictured epithelial monolayer, an intrinsic or extrinsic apoptotic or necrotic insult to discrete epithelial cells is communicated to surrounding epithelial cells and resident innate immune cells. 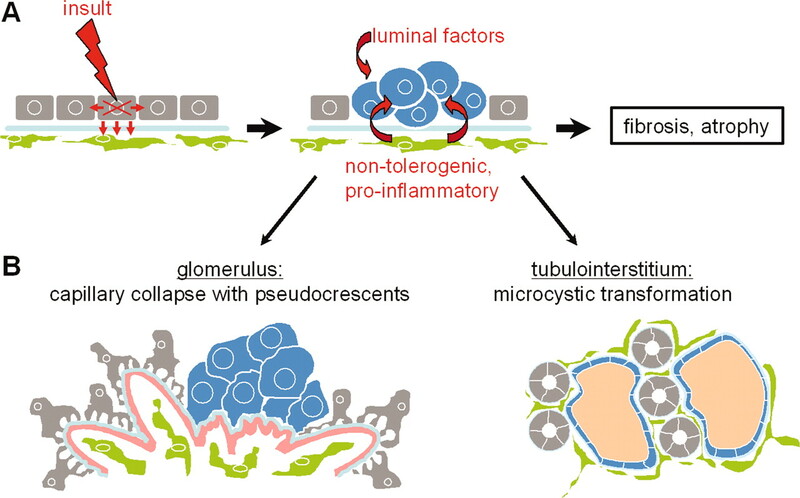 Rather than induce normal repair or cytostasis by adjacent epithelial cells, a proinflammatory, nontolerogenic response promotes aberrant hyperplasia. This eventually will progress to fibrosis and atrophy of the injured parenchyma. Factors within the lumen and preexisting states of immune deviation also may contribute to creating this mitogenic and fibrogenic microenvironment. (B) The consequence of this aberrant hyperplastic response within specific compartments of the kidney is to disrupt structure–function relationships that are required for normal nephron function. Within the glomerulus, proliferating, dedifferentiated podocytes and recruited parietal epithelium cannot contribute to the glomerular filtration barrier or to the maintenance of patent capillary loop structures. Within the tubulointerstitium, this aberrant hyperplastic response manifests as microcystic transformation. No evidence-based therapy exists for CG, and current therapeutic strategies derive from the empiric approach that CG may be treated by analogy to other renal diseases or associated disorders (119–121). Not surprising, then, the current recommendations for how to treat CG are based on anecdote, retrospect, and expert opinion (119–121). The leading recommendations for the treatment of CG in non–HIV-infected patients suggest drug regimens that are used to treat FSGS (119,120). Table 4 lists patients’ renal outcomes from all reports that have analyzed retrospectively the therapeutic response of CG in HIV-negative patients who were treated by analogy to FSGS (1,12,13,15,16,119,122). Although the drugs, dosage, duration of treatment, and definition of therapeutic response vary among studies, it is clear that a report of full remission (9.6% of all patients treated) or partial remission (15.2% of all patients treated) altogether was infrequent. Likewise, the recommended first-line therapy for CG in HIV-positive patients is highly active antiretroviral therapy (HAART) to target the associated disorder, HIV-1 infection (121). One estimate that was calculated from retrospectively collected data from the Centers for Disease Control and Prevention and the US Renal Data System found that the rate of progression of CG to ESRD in HIV-positive patients may be slowed by as much as 38% with the use of HAART (123). Although hopeful, a recent analysis of renal outcomes in a large multicenter study of HIV-positive patients with CG that was diagnosed and treated in the post-HAART era reported a need for renal replacement therapy in 50% of the cohort by approximately 390 d (13 mo) after presentation (124). Therefore, given the lack of treatments that can induce durable remission in the majority of all patients with CG, there is a clear need for new therapeutic strategies. Physiologic structure–function relationships within the kidney require the presence of quiescent, differentiated renal parenchyma, and one therapeutic strategy that has demonstrated preservation of renal function in preclinical studies in animals is to induce growth arrest of aberrantly proliferating renal epithelium (125). Small molecule inhibitors of the cyclin-dependent kinases that control cell-cycle progression in renal epithelium can prevent and reverse experimental CG from different insults (126–129). Likewise, experimental CG can be ameliorated by retinoic acid derivatives that activate retinoic acid receptors, transcription factors that inhibit mitogenesis signaling and upregulate genes that promote differentiation of renal epithelium (130). It is interesting that small molecule inhibitors of inflammatory pathways that are controlled by NF-κB and cyclooxygenase-2 also have improved renal function in experimental CG (86,131), highlighting the multifactorial basis for the proliferative phenotype in CG. Taken together, these preclinical studies signal that rational approaches to therapy for CG on the basis of knowledge of pathogenesis rather than of empiricism may be on the horizon. Much progress has been made in research into the pathogenesis and treatment of CG during the past two decades. The growing awareness of the diagnostic criteria for CG has increased the reporting of associated disorders, thereby contributing to clinical correlates that may stimulate research into causative mechanisms for CG. This inquiry is aided by the identification of the first susceptibility genes for CG and the explosive growth in murine modeling of CG, each providing important insights into the pathogenesis of CG. Finally, the success of preclinical testing of new therapeutic strategies on the basis of knowledge that already has been gained from studies in humans and animals holds promise that CG will not herald poor outcomes for patients in the future. M.A. is supported by a Research Fellowship Award from the Amgen Nephrology Institute. T.J.S. is supported by a Pilot Project Award from the National Institutes of Health Center for Aids Research grant AI027742. P.J.N. is supported by National Institutes of Health grant DK065498.